How Your Different Facebook Accounts "Talk" to Each Other. How your personal Facebook Profile, organization's Facebook Page, ActionSprout account and Facebook Ads Manager all work together. Your personal Facebook profile is your key to the kingdom. This is how you will log into Facebook to access your organization’s Facebook Page and Facebook Ad Account. You will also need this to sign up for, authorize and use an ActionSprout account. Note: You should access your Facebook Page through the personal profile that you use every day. You will not need to create a separate profile used to log in and access your Page. This is your organization’s “real estate” on Facebook where you’ll advocate for your cause acting as your organization. Mostly, this Page is for publishing content through which you'll reach and engage your supporters in their individual News Feeds. People don't usually search for and visit Facebook Pages, so it's important to post great content many times a day to ensure landing in folk's feeds. This is the account through which you will run your ads. Facebook ads are not created or managed through your Facebook Page. Likewise, having admin or editor privileges to your organization’s Facebook Page does not mean that you have default access to the ad account. You must still be granted permission to the ad account. Ad accounts are created and owned by individual users, not Pages. Once you have an ad account, you can name it and give it a primary payment method. This is what makes it “personal” or “professional.” Your “Page’s” ad account has simply been given the same name as your Page and is linked to your organization’s credit card. Think of it as your advertising bank account on Facebook. A bank account can be personal or professional. Until you name it and give it funds, it just is. Or, you can set up different ad accounts for each Page that you manage. This can be helpful if each Page has a separate team that will be helping you run the ads. How you set this up is entirely up to you. ActionSprout is separate from, and does not replace, Facebook. To access your ActionSprout account, you’ll visit the ActionSprout website at actionsprout.com and log in. Even though ActionSprout is connected to your Facebook Page, you cannot access your ActionSprout tools through facebook.com or through your Facebook Page. Nor does ActionSprout exist inside your Facebook Page or Ad Account. 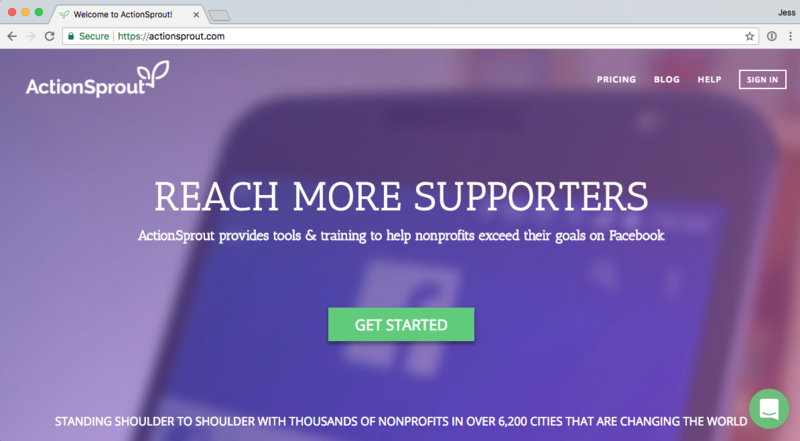 Think of ActionSprout as an outside accessory to your organization’s Facebook Page. It allows you to do more through Facebook but does not replace your Facebook Page or Facebook Ad Account. Please note: You will access ActionSprout via your personal Facebook profile just like you access your organization’s Facebook Page through your personal profile. Once logged in, you will select the Facebook Page that you’d like to work on. This does not mean that ActionSprout will be connected to or posting to your personal profile. Inside your ActionSprout account, you’ll find a tool called SmartAds. This tool does not replace your Facebook Ads Manager. It can, however, help you to automate some of the ads process and make things easier on you, especially if you are new to Facebook advertising. You can learn more about SmartAds here. That's a quick tour of your different Facebook accounts and how they all work together. Now sign in or sign up for ActionSprout to get to work reaching your goals on Facebook!